Browse: Home / The Mastermind Behind 911? System Planning Corporation designs, manufactures and distributes highly sophisticated technology that enables an operator to fly by remote control as many as eight different airborne vehicles at the same time from one position either on the ground or airborne. For those looking for an extraordinarily interesting hobby, please see photos and specs of this hardware (about the size of a small refrigerator)at www.sysplan.com/Radar/CTS Just be sure your mom doesn’t catch you causing havoc with the airlines. Also, System Planning Corporation markets the technology to take over the controls of an airborne vehicle already in flight. For example, the Flight Termination System technology could hijack hijackers and bring the plane down safely. The Flight Termination System can be used in conjunction with the CTS technology that can control up to 8 airborne vehicles simultaneously. see www.sysplan.com/Radar/FTS Unfortunately, these systems as of yet are not able to prevent lyrics such as “When you get caught between the moon and New York City”! The possibility of nefarious use of these brilliant technologies developed and deployed by Systems Planning Corporation certainly deserves careful consideration in any full and impartial investigation of what actually took place on 9/11. 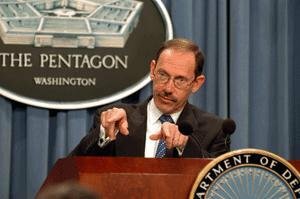 In the context of 9/11 it also needs to be pointed out that Rabbi Dov Zakheim was Chief Executive Officer of System Planning Corporation’s International Division until President George W. Bush appointed him Undersecretary of Defense and Comptroller of the Pentagon. Not long before Rabbi Zakheim rose to power over the Pentagon’s labyrinthine, bottomless accounts, he co-authored an article entitled “Rebuilding America’s Defenses: Strategy, Forces and Resources for a New Century” which was published by The Project for a New American Century in September 2000, exactly a year before 9/11; in this article, on page 51, it is stated that “the process of transformation, even if it brings revolutionary change, is likely to be a long one, absent some catastrophic and catalyzing event – like a new Pearl Harbor”! Well, there you have it! Motive, means and opportunity all rolled into one and existing between Rabbi Dov Zakheim’s ears. The motive was that a false flag intelligence operation would trigger a response by the USA that would be good for the Zionist state. The means consisted of the aforementioned remote control of airborne vehicle technologies as well as the nurturing, creative accounting at the Pentagon to pay for such an operation. The opportunity was Zakheim’s closeness to the Command/Control/Communications in our nation’s capital and its interwoven cousin network of psychopathic Zionist Neo-Cons all hell-bent on provoking a war with Saddam Hussein. In March this year, Rabbi Dov Zakheim resigned from his position at the Pentagon. Although he refused to tell journalists the exact reason for his departure, he hinted that his job as the Pentagon’s chief financial officer, controlling the flow of hundreds of millions of dollars, was exhausting.